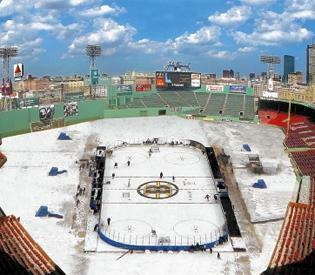 I think a Bruins vs Canadiens winter classic would generate huge ratings. I agree Mike. With as many people as their are who root for Boston in New England and with the number of fans the Canadiens have all over North America, those two facts alone would yield some decent ratings. I think its too early to tell whether a “trend” has begun or not as far as excluding Canadian teams from winter classic goes. So far there have only been 2 winter classic games, and only 4 teams (5 including Boston) have had the opportunity to play in a winter classic. Could a case not be made for the other 25 teams in the league that their team has been excluded year after year as well? If the NHL only does one winter classic per year, and none of the teams are repeated, it will take 15 years before the last year gets their winter classic game. So with that said, its not that shocking that a canadian team has not played in a game yet. Plus, anyone remember the 2003 Heritage classic between the oilers and the canadiens? I guess a case could be made the the very FIRST outdoor winter classic was solely between canadian teams.